A mother will go to any lengths to save her child, as this little duck shows us. Ray Petersen, who is a civilian member of the Vancouver police force, was walking under the Granville St. Bridge when a duck made its presence known to him by holding onto his pant leg, then walking around him, talking in duck language (quacking). 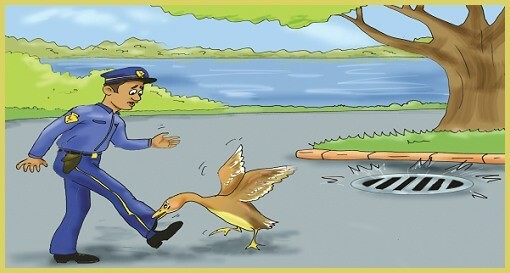 Since he is not fluent in quackery (duck language), he pushed the duck away; however, the duck made sure that Mr. Petersen was watching her, and went to sit on a storm-sewer grate a little distance away. When Mr. Petersen tried to walk away, the duck again took a hold of him by the pants, and then went to the sewer grate again. This time Mr. Petersen followed her, and saw why she was so upset: her eight babies had fallen through the grate into the water, and she was doing her best to get them rescued. Mr. Petersen called the police, who sent two constables and a tow truck to lift the grate up. The duck sat a little distance away and watched carefully. The ducklings were picked up one by one with a vegetable strainer. Once her babies were safe, she walked them down to a nearby creek, where they all jumped in the water. What an intelligent duck, and what a good mother!